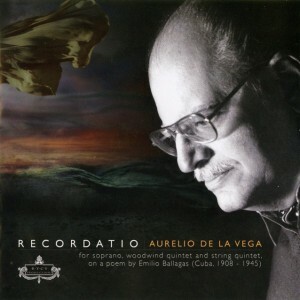 Produced by RYCY Productions and published by DLV Music Publishing Company, the piece was written for soprano, woodwind quintet and string quintet and is based on a poem by the late Cuban poet Emilio Ballagas and performed by de la Vega’s wife, Anne Marie Ketchum. De la Vega says he is delighted to be nominated for the third time. The piece highlights the soon-to-be 92-year-old composer’s many efforts to preserve the Cuban identity of his youth. 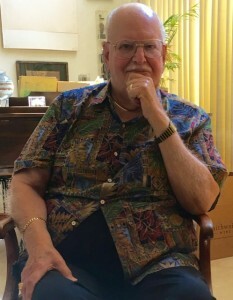 Ricardo Pau-Llosa, professor of English at Miami Dade College and longtime admirer and friend of de la Vega, said the composer exemplifies the marriage of Cuban culture and American identity. De la Vega, born on Nov. 28, 1925, in Havana, Cuba, studied law at the University of Havana and music composition at the Conservatorio Ada Iglesias. He also studied independently with Fritz Kramer in Havana and Ernst Toch in Los Angeles from 1947-48. He served as cultural attaché in the Cuban Consulate in Los Angeles and toured the United States as a lecturer from 1952-54. Decrying the rise of communism on the Caribbean island in the mid 20th century, de la Vega fled the tyrannical regime of Fidel Castro, resenting the shackles placed on the liberties of the people he had left behind. Aurelio de la Vega at his home in Northridge. Photo by Lucas A. Wiggins. Seeking asylum, de la Vega joined the faculty of what was then San Fernando Valley State College, now CSUN, in 1959, settling in Los Angeles and becoming a naturalized citizen in 1966. He was nominated for his first Latin Grammy, best classical contemporary composition, in 2008 for his “Variación del Recuerdo (Variations of the Remembrance),” performed by the North/South Chamber Orchestra. He received his second Latin Grammy nomination for best classical contemporary composition for his piano piece, “Preludio No. 1,” performed by pianist Elizabeth Rebozo on her “Live in L.A.” album. Throughout his teaching years and in the years since his retirement in 1993, de la Vega has been an active composer and music lecturer. His list of compositions includes symphonic pieces, chamber music works, solo instrumental pieces, vocal works and piano, guitar, ballet and electronic compositions. Major orchestras and prominent soloists throughout the world have performed his works. In 2000, the Library of Congress honored de la Vega when his graphic score, “The Magic Labyrinth,” was included in the library’s 733-page volume, “Music History from Primary Sources.” Among the music greats included with him were Bartók, Beethoven, Brahms, Chopin, Gershwin, Handel, Liszt, Mahler, Mendelssohn, Mozart, Puccini, Stravinsky and Verdi. A documentary about de la Vega’s life, “Aurelio: Rebel with a Cause,” directed by Camilo Vila and narrated by Andy Garcia, was released in 2015. Aurelio de la Vega talks about the impact of new technology on classical music.